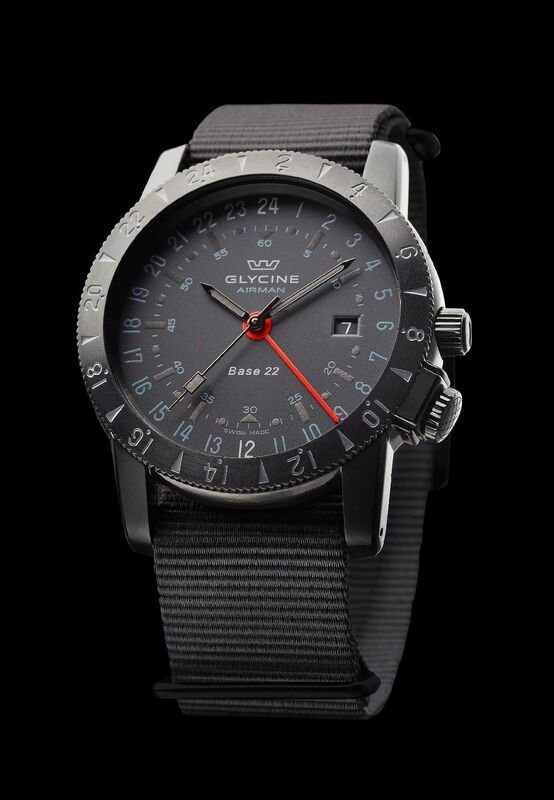 Swiss watch brand GLYCINE adds the new Base 22 “MYSTERY” model to its impressive and distinctive AIRMAN collection. The “MYSTERY” is available in mysterious black and even at first glance, it is clearly an Airman and meets the exacting requirements of an aviator watch. The 42mm black case, black dial with clear luminous elements and comfortable NATO strap are not only aesthetically harmonious but make it ideally suitable for night missions. This black beauty is powered by a rhodanised ETA 2893 movement. The Base 22 “MYSTERY” is completely in keeping with Glycine tradition as the watch is available in 2 different versions: a basic 24-hour watch with two time zones (the so-called “purist”) and the GMT version with 3 time zones and red GMT hand. The origin of the legendary Airman dates back to 1953. It was developed in flight, between Bangkok and Calcutta. During the flight, the pilots explained to a Glycine employee exactly what airline pilots were looking for in a modern frequent-flyer watch. The first Airman was developed and introduced to the market that same year, becoming one of the real pioneers of Swiss aviator watches.